The client based out of San Diego, California, USA, is a well-known name in the field of Fuel Systems market. With their focus on engineering, construction, and fuel equipment development and maintenance, the client has helped numerous customers. Right from professional engineering design services to preparing SPCC plans for operating facilities, the client provides an end-to-end solution for fuel pump installations. The client has gained a reputation with their construction services that include design-build, turn-key services which help in minimizing the risk of spills and other liabilities for their customers during traditional installations. The client seamlessly provides their wide gamut of services to a number of industries that include aviation, biotech & healthcare, construction, data centers, industrial & manufacturing, hotels & resorts, mining, military Facilities, rail systems, retail petroleum, roads & highways, water & storm water storage, science & technology, and utilities, etc. The client needed a partner with ample experience in Revit drafting to help them with complex layouts of fuel pumps. The existing layouts were blurred and had lots of markups which needed to be carried out in the new design, which warranted a dedicated team with experience in creating complex engineering layouts. The initial challenge involved remodeling various old PDF layouts with handwritten markups that were not legible or coherent. This posed an issue which needed extensive care and understanding from the team to gather enough information on similar layouts to finalize the required changes. We interpret the markup which was initially ineligible and used the information to remodel pdf layouts as required by the client. Thereafter, Revit models were designed for fuel pumps. We were able to deliver the project on time with client satisfaction. Outsource2india is an ISO-certified company with expertise in providing cost-effective intricate Revit models to an extensive list of satisfied clients. for over 20 years, resulting in several success stories. Team of Engineers, Architects, and Draftsmen at Outsource2india come with rich experience across various industry verticals along with all the latest codes of practice globally. 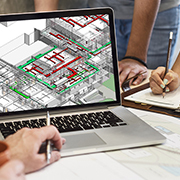 We seamlessly put together markups from paper or PDF to Revit models. Our team not just converts but also provides value by pointing out errors that can pose a threat to the design execution later. With our extensive experience in designing layouts, we are an ideal engineering services partner for your Revit related requirements. Contact us if you have similar needs and get a free quote on the project within 24-hours.